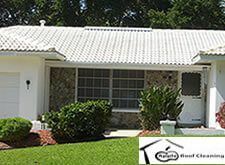 Our roof cleaning crew believes in offering the finest degree of service in Clearwater Fl. Therefore, we work to make scheduling your roof washing appointment as easy as possible. Additionally, our cleaning agency never takes the shortcuts that some companies do as we want to make you another thrilled customer. Our staff is one of the biggest elements in accomplishing this objective. With that in mind, our cleaning team will likely tell you that they give their hats off to the state-of-the-art cleaning equipment they have the opportunity to work with on a daily basis. To top it off, our squad receives extensive training in regards to how to safely operate our cleaning equipment. At the first glance of a faded roof structure, a lot of people in Clearwater Fl We feel that their only choice is to deal with it or change the entire roof. However, it will not take them long to understand that purchasing a new roof is no longer the only solution thanks to our expert staff’s capability to clean their roof. The U.S. based Asphalt Roofing Manufacturers’ Association specifies Soft wash Chemical cleaning solution, without the use of pressure washer, to remove algae from shingle / tile roof. ARMA discourages the use of pressure washing on any type of roof !! The only safe and effective means to clean a roof is air diaphragm pump sprayer system, originally developed in USA early 1990s.